Cornbread muffins, hushpuppies, corn pone and Johnny cakes can trace their ancestry to the original cornbreads first baked, boiled and fried by the Native American Peoples. One major difference between today’s cornbreads and historical Northeastern Native cornbreads was the absence of leavening agents like baker’s yeast or baking soda (often I am asked about wild yeast and the like... besides the lack of evidence for its use in cornbread making, the reader should keep in mind that leaving agents really work better with wheat gluten - the matrix that traps gas bubbles, and our modern cornbread may owe just as much of it's fluffy texture to the wheat gluten as the leavening agents). Native cornbreads of the past were denser and quite filling, as well as very “corny” in flavor (as European-introduced wheat flour wasn’t traditionally used, as it is in cornbread recipes today). New World cooks were able to achieve the dough textures they wanted, whether it be for making small cakes, large loafs, or dumplings, and do so without the use of European bread ingredients like milk, eggs, and wheat flour. Two main types of corn dough were made by historic Woodland Peoples: dough made from dry cornmeal, and batter made from green corn. The first is more widely known today and serves as the base to cornbreads sold in boxes on supermarket shelves. Cornmeal was made from dried shelled corn (8-Row Eastern varieties of corn prior to European contact), parched corn (dry corn that has been roasted), and hominy (hominy was made of dry corn processed with ash alkali). Dry, hard kernels were ground in large wooden "corn mortars” with wooden pestles. 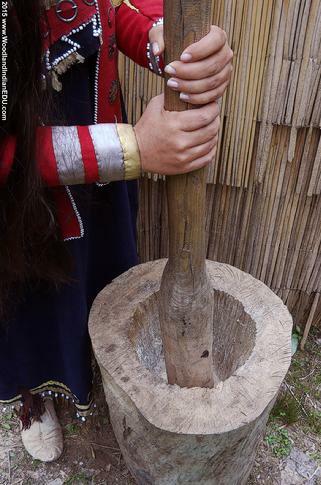 Photo Above: The author grinds corn into meal using a traditional wooden log mortar and corn (double-headed/counterweight) pestle. Because cornmeal of unprocessed corn (plain dried corn) can be gritty, many had there own methods to soften the cornmeal texture when a hearty bread was not desired. In New England, a Native cook was seen boiling the meal before baking, and another observed a Native person "steeping" the dough. James Adair, among the Southeasten Native Peoples, mentions the practice of steeping a loaf (cornbread) before baking it. These practices of precooking meal or even boiling or steaming cakes of cornbread were probably much more widespead than ever seen or recorded by outsiders. Breads made of hominy meal were said to keep their shape better than plain corn flour. In the alkali treatment, corn starches gelatinize, creating a different texture for bread-like applications. 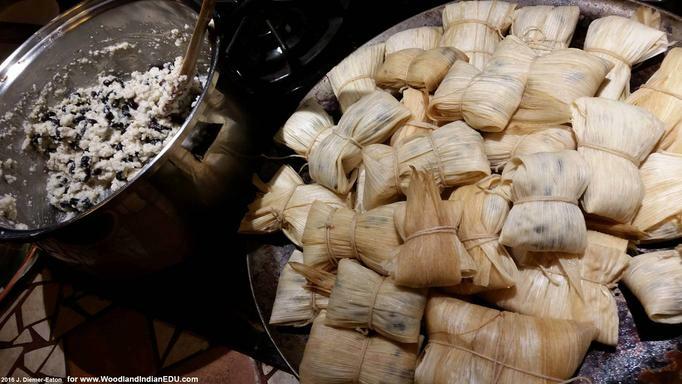 For example, traditional tortillas of Mexican cuisine use the finely ground flour of hominy (made by processing corn with lime instead of hardwood ashes). You may recognize coarsely ground hominy meal today by the name of grits. Hominy dough could be made of either dry hominy meal or wet hominy paste. Such cakes made of this hominy batter were often boiled (sometimes in a leaf/husk covering - more on leaf bread later), but baking and shallow frying were options as well. Other ways to change the dough texture, and the taste, was by adding other ingredients. Nut meals were among some of the most noted to be added to bread dough; the oily nature of the fresh ground-up nut meats added a pleasing texture to corn dough. Hickory nuts, butternuts, and walnuts were all used, as well as chestnuts. Chestnuts were a favorite nut among southern New England and Mid-Atlantic Native communities, being used in cornbreads and corn puddings. Acorns, while they contain tannic acid (some more than others), the higher tannin content was simply leached out of such to make the nuts digestible. Acorn meal could be made in large quantities, an example the Native Peoples of southern California had demonstrated quite successfully (an area where horticulture was unnecessary due to the provisions of the oaks – making acorn meal a predominant grain of the region). Other ingredients historically noted to be added to dry cornmeal dough includes berries, squash, and beans. Squash and beans could be added fresh, or dried and grounded into a meal that was mixed with the cornmeal – both ingredients could soften the texture of cornmeal. Another ingredient that was added for flavoring was dried deer, bear, and other meats, ground into a powder and mixed into the meal. Maple sugar was also used at times to add a sweeter flavor to breads, especially for the Northern Nations... whereas salt was used a little more among Southern Native communities, until some European flavors took hold in Native cuisine and salting foods became a little more widespread. The flavor variations were numerous, and Native cuisine took full advantage of the breadth of ingredient combinations. Some bread recipes that called for dry cornmeal mixes included ashcakes, Johnny cakes and some boiled breads. Such breads were enjoyed with a smear of bear grease or dipped into meat juices or gravies of sorts. Photo Above: Corn-in-the-Milk Batter and Dry Miami 8-Row Flour Corn... scraped green corn batter comes from cobs harvested before they dry on the stalk (Green Corn or first harvest vs second or main harvest). The second type of corn dough utilized by Woodland Peoples was made from green corn (fresh corn). In using green corn to make bread, the corn kernels were cut, or most often, scraped from the cob. Deer jaws are prime tools for this job - the back and forth motion of the teeth saws through the kernels, popping the soft seed insides out of the hulls. The fluffy mass, "corn-in-the-milk" as it's often referred to (corn juice), was then prepared into dough (when mixed with dry meal) or wet batters. Often this type of batter was utilized in tamale-like applications, were the batter was enclosed in green husks or other types of leaves, sometimes with another ingredient (usually beans), then boiled or baked. The Kickapoo are noted to have at least a couple of these green-corn batter leaf-bread recipes, the Iroquois/Haudenosaunee a couple too, and the Delaware their own version (actually, probably every Native community that grew corn in the East had a version, or two or three, or green-corn batter leaf bread, but we'll explore only a few here). 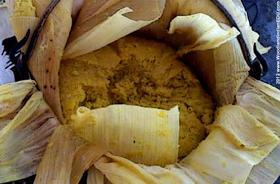 The historic Delaware/Lenape were noted to use green corn meal to make a tamale-like dish – that is cornbread baked in a cornhusk envelope. Nora Thompson Dean, when referring to traditional Delaware dishes she grew up with in the early 20th century, states that baked corn-in-the-milk bread was also at times dried for later use. This was achieved by baking green corn batter (which she grated upon a rough wooden grater), crumbling the baked bread and then laying it out to dry (which for her meant laying it out on sheets on the roof of her home). To use the dried corn-in-the-milk bread or “kahahpon,” it was added to cold water, boiled for a while and flavored with grease (in the likeness of an oatmeal or grits). Many of these leaf breads, whether using green-corn batter or dry cornmeal, included beans, referring to the bread as either leaf bread or bean bread (depending on the culture). The Cherokee are probably most famous for bean bread, but their Iroquoian cousins to the north, the Haudenosaunee, also had a version of bean bread too. One Kickapoo version of leaf bread included beans, and the Choctaw called their leaf/bean bread "banaha." Photo Above: The author makes leaf/bean bread in her kitchen, combining corn dough made of hulled Iroquois White Corn (from Iroquois White Corn Project) with heritage Cherokee beans (grown by the author). The leaf bread is next cooked in boiling water. The Iroquois/Haudenosaunee also made and enjoyed baked small cornbread cakes in husks, but larger loafs of green or corn-in-th-milk cornbread were also cooked in the green leaves of basswood trees. In making this bread, known as "ogon’sa," Haudenosaunee cooks poured the runny milky corn mass into leaf-lined cooking vessels (presumably earthenware pots before trade metal kettles), sealing the top with the same leafs. The pot was then surrounded by hot coals (an option for pit/ground baking) or suspended over a fire with hot coals covering the top, and the green corn baked overnight. By morning, the bread was done baking into a gummy bread that was said to be the most delicious of all cornbreads (Photo to the Right: A pot of scraped green cornbread made in traditional manner by the author, in a brass trade kettle using wet corn husks in place of green leaves). Like the previous Delaware/Lenape recipe, this bread was also noted to be saved for later consumption, especially for the winter. After baking, the bread was sliced and laid out to dry thoroughly. When desired, the dried slices of bread were boiled for a short time, producing the same dish Nora Thompson Dean grew up with (mentioned earlier). 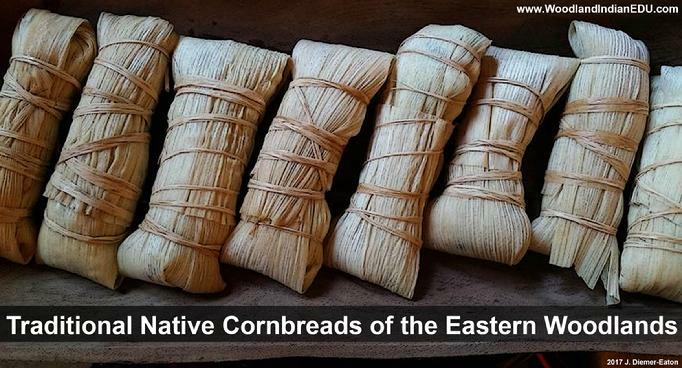 Indeed, whether baking cornbreads in husk/leaves, drying cornbreads for later use, or enjoying a cornbread mush, many horticultural Northeastern Peoples had similar dishes, probably due to similar crops, lifestyles, and communication between Native communities/cultures.